Abstract: Nanosilver particles (NSPs), are among the most attractive nanomaterials, and have been widely used in a range of biomedical applications, including diagnosis, treatment, drug delivery, medical device coating, and for personal health care. With the increasing application of NSPs in medical contexts, it is becoming necessary for a better understanding of the mechanisms of NSPs' biological interactions and their potential toxicity. In this review, we first introduce the synthesis routes of NSPs, including physical, chemical, and biological or green synthesis. Then the unique physiochemical properties of NSPs, such as antibacterial, antifungal, antiviral, and anti-inflammatory activity, are discussed in detail. Further, some recent applications of NSPs in prevention, diagnosis, and treatment in medical fields are described. Finally, potential toxicology considerations of NSPs, both in vitro and in vivo, are also addressed. 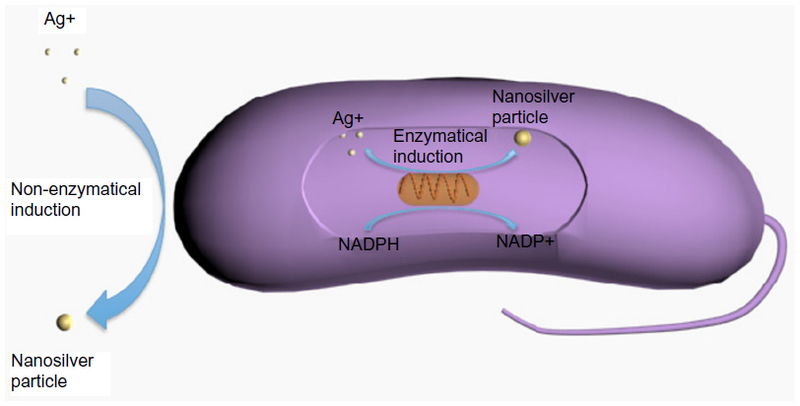 Figure 1 Biomedical applications of nanosilver particles in human health care. 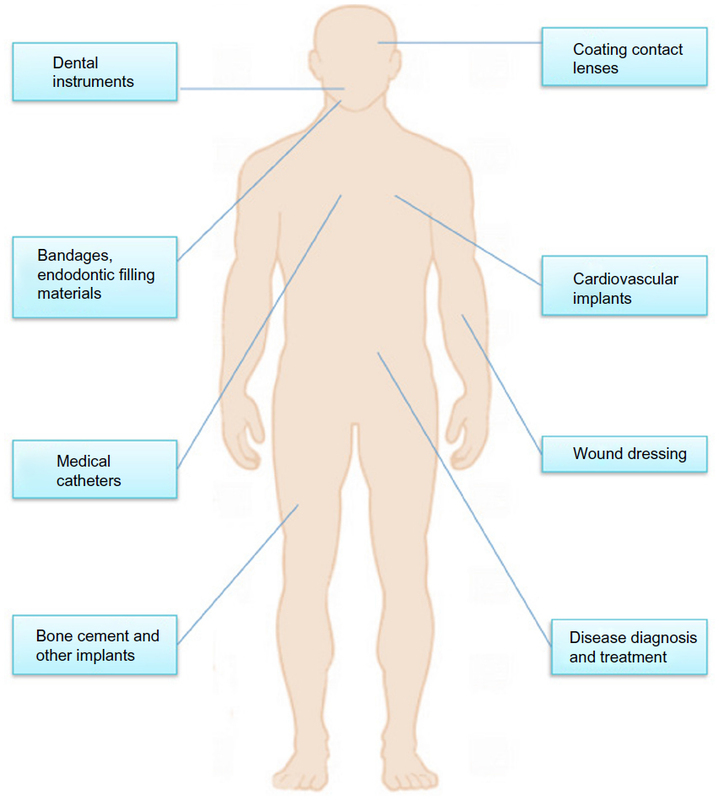 NSPs have been widely used for diagnosis,7 treatment,8 drug delivery,9 medical device coating,10 wound dressings,11 medical textiles,12 and contraceptive devices.13 As the use of nanosilver products is continually increasing, a better understanding of nanosilver biological interactions and their toxicity becomes necessary. This review critically discusses NSP synthesis methods, properties, and current and emerging medical NSP applications. Finally, recent advances concerning NSP potential toxicity will also be described. Different synthetic NSP routes lead to variable sizes, shapes, morphology, and even stability. Generally, these methods can be classified into three broad categories: physical, chemical, and biological (or green) synthesis. Figure 2 Chemical synthesis of nanosilver particles. NSPs can also be synthesized in a two-phase water-organic system. This method produces uniform and controllable nanoparticles. In this system, metal precursor and reducing agent are separated in two phases, thus the rate of interaction can be controlled by the intensity of interphase transport between aqueous and oil phases; however, large amounts of surfactant and organic solvent may contaminate the surface of formed NSPs, and the removal of surfactant and organic solvent is also time-consuming and expensive. Figure 3 Biological (or green) synthesis of nanosilver particles. Abbreviations: NADP+, nicotinamide adenine dinucleotide phosphate (oxidized form); NADPH, nicotinamide adenine dinucleotide phosphate (reduced form); Ag, silver. Figure 4 Antibacterial mechanism of nanosilver particles. Nanosilver is an effective antifungal agent against a broad spectrum of common fungi. Kim et al investigated NSP antifungal properties on a total of 44 strains of six fungal species, and found that NSPs can inhibit the growth of Candida albicans, Candida glabrata, Candida parapsilosis, Candida krusei, and Trichophyton mentagrophytes effectively.38 Nasrollahi et al39 and Kim et al40 observed that NSPs can disrupt cellular membrane and inhibit the normal budding process; however, the exact mechanisms of action of nanosilver against fungi are still not clear. NSPs show anti-inflammatory properties in both animal models and in clinic. For example, in the swine model with contact dermatitis induced by topically applying 1,2-dinitrochlorobenzene, nanosilvers altered the expression of proinflammatory cytokines transforming growth factor-b and tumor necrosis factor-a.48 Shin and Ye found that NSPs attenuated nasal symptoms in allergic rhinitis mice and inhibited OVA-specific immunoglobulin E, IL-4, and interleukin-10, and that inflammatory cell infiltration and goblet cell hyperplasia were inhibited by nanosilvers.49 In a human clinical study, wound dressing containing NSPs promoted the healing of chronic leg ulcers by not only reducing bacteria numbers in the wound bed, but by decreasing inflammatory response as well.8 NSPs’ ability to reduce cytokine release and matrix metalloproteinases,8,50 decrease lymphocyte and mast cell infiltration,48 and induce apoptosis in inflammatory cells8,49 may explain their anti-inflammatory mechanisms. Robert Burrell developed the world’s first commercially available nanosilver product (Acticoat™; Smith and Nephew, London, UK) to treat various wounds in clinic, including burns, chronic ulcers, toxic epidermal necrolysis, and pemphigus.51 Huang et al observed that NSP-loaded wound dressings significantly reduced the healing time by an average of 3.35 days and increased bacterial clearance from infected wounds compared to silver sulfadiazine, with no adverse effects;52 however, Chen et al showed that nanosilver-loaded wound dressings could enhance healing in superficial burn wounds but made no difference in deep burn wounds, compared with 1% silver sulfadiazine.53 This suggests that NSPs accelerate reepithelialization but not angiogenesis. The first cardiovascular medical device containing silver in clinic was a prosthetic silicone heart valve coated with silver element, which was designed to prevent bacterial infection on the silicone valve and to reduce inflammation response;55 however, metal silver may cause hypersensitivity, inhibits normal fibroblast function, and leads to paravalvular leakage in patients.56 NSPs are safe and nontoxic in medical devices, unlike metal silver. Therefore, Andara et al synthesized a new nanocomposite with NSPs and diamond-like carbon as a surface coating for heart valves and stents, and found that the surface of the nanocomposite showed antithrombogenic and antibacterial properties.57 In addition, Ghanbari et al58 and Fu et al59 also constructed antibacterial multilayer films containing NSPs, and investigated their antibacterial, mechanical, and hemodynamic properties in vitro for use in cardiovascular implant coating. NSPs may have potential toxicities at some concentrations and can cause various health problems if used improperly. Thus, it is necessary to address the biosafety of NSPs in human health. NSPs have been reported to be cytotoxic to several types of cells, including human peripheral blood mononuclear cells,74 human alveolar epithelial cell line (A549)75, murine and human alveolar macrophage cell line,76 neuroendocrine cells,77 rat liver cell line,78 and mouse germline cells.79 Alt et al, however, found that bone cement containing 1.0% nanosilver did not lead to significant cytotoxicity in mouse fibroblasts (L929) and human osteoblast cell line.61 Although the details of the toxic mechanism are unclear, it suggests that NSPs are ionized in the cells, which leads to activate ion channels and changes the permeability of the cell membrane to both potassium and sodium,80 interaction with mitochondria,81 and induction of the apoptosis pathway via the production of reactive oxygen species,82 which leads to cell death. Animal and human studies indicate that it is difficult to remove silver completely once it has been deposited in the body; however, nanosilver can be excreted through the hair, urine, and feces.88 There is no consensus on nanosilver’s toxicity to humans, and most toxicity investigations of silver nanoparticles are based on in vitro cellular experiments and relatively short-term animal experiments. NSPs represent a prominent nanoproduct and are already widely used in medical applications, including wound dressing, diagnosis, and pharmacological treatment. Since the shape, size, and composition of NSPs can have significant effects on their function and possible risks to human health, extensive research is needed to fully understand their synthesis, characterization, and possible toxicity. In this review, we first gave an overview of NSP synthesis, then reviewed applications of NSPs in the field of biomedicine. Finally, possible toxicology was discussed. There is a limited number of well-controlled studies on the potential toxicities of nanosilver, though these studies tend to suggest that NSPs can induce toxicity in living beings. It should be noted that in vitro conditions are drastically different from in vivo conditions; however, longer-term studies and assessment of NSP toxicity must be conducted so that NSP exposure does not exceed toxic levels. This work was supported by International Science and Technology Cooperation Program of China (S2013ZR0398), Chongqing Basic Scientific Research Grant (cstc2013jcyjC80001), Chongqing Agriculture Development Grant (14408, 12402), the NSERC Discovery Grant, Manitoba Health Research Council, Dr Moorehouse Fellowship, Manitoba Institute of Child Health and China 863 Project (Grant 2012AA020504). Chen J, Ouyang J, Kong J, Zhong W, Xing MM. Photo-cross-linked and pH-sensitive biodegradable micelles for doxorubicin delivery. ACS Appl Mater Interfaces. 2013;5(8):3108–3117. Mohamed A, Xing MM. Nanomaterials and nanotechnology for skin tissue engineering. Int J Burns Trauma. 2012;2(1):29–41. Tian Y, Chen J, Zahtabi F, Keijzer R, Xing M. Nanomedicine as an innovative therapeutic strategy for pediatric lung diseases. Pediatric Pulmonol. 2013;48(11):1098–1111. Xing M, Zhong W, Xu X, Thomson D. Adhesion force studies of nanofibers and nanoparticles. Langmuir. 2010;26(14):11809–11814. El-Badawy A, Feldhake D, Venkatapathy R. State of the Science Literature Review: Everything Nanosilver and More. Washington, DC: US Environmental Protection Agency; 2010. Zhong W, Xing MM, Maibach HI. Nanofibrous materials for wound care. Cutan Ocul Toxicol. 2010;29(3):143–152. Uchihara T. Silver diagnosis in neuropathology: principles, practice and revised interpretation. Acta Neuropathol. 2007;113(5):483–499. Sibbald RG, Contreras-Ruiz J, Coutts P, Fierheller M, Rothman A, Woo K. Bacteriology, inflammation, and healing: a study of nanocrystalline silver dressings in chronic venous leg ulcers. Adv Skin Wound Care. 2007;20(10):549–558. Skirtach AG, Muñoz Javier A, Kreft O, et al. Laser-induced release of encapsulated materials inside living cells. Angew Chem Int Ed Engl. 2006;45(28):4612–4617. Galiano K, Pleifer C, Engelhardt K, et al. Silver segregation and bacterial growth of intraventricular catheters impregnated with silver nanoparticles in cerebrospinal fluid drainages. Neurol Res. 2008;30(3):285–287. Moore K. A new silver dressing for wounds with delayed healing. Wounds UK. 2006;2(2):70–78. Vigneshwaran N, Kathe AA, Varadarajan PV, Nachane RP, Balasubramanya RH. Functional finishing of cotton fabrics using silver nanoparticles. J Nanosci Nanotechnol. 2007;7(6):1893–1897. Chen X, Schluesener HJ. Nanosilver: a nanoproduct in medical application. Toxicol Lett. 2008;176(1):1–12. Jung JH, Oh HC, Noh HS, Ji JH, Kim SS. Metal nanoparticle generation using a small ceramic heater with a local heating area. J Aerosol Sci. 2006;37(12):1662–1670. Tsuji T, Iryo K, Watanabe N, Tsuji M. Preparation of silver nanoparticles by laser ablation in solution: influence of laser wavelength on particle size. Appl Surf Sci. 2002;202(1–2):80–85. Abid JP, Wark AW, Brevet PF, Girault HH. Preparation of silver nanoparticles in solution from a silver salt by laser irradiation. Chem Commun (Camb). 2002;(7):792–793. Tien DC, Liao CY, Huang JC, et al. Novel technique for preparing a nano-silver water suspension by the arc-discharge method. Reviews on Advanced Materials Science. 2008;18:750–756. Evanoff DD Jr, Chumanov G. Synthesis and optical properties of silver nanoparticles and arrays. Chemphyschem. 2005;6(7):1221–1231. Pyatenko A, Yamaguchi M, Suzuki M. Synthesis of spherical silver nanoparticles with controllable sizes in aqueous solutions. J Phys Chem C. 2007;111(22):7910–7917. Blanco-Andujar C, Tung LD, Thanh NTK. Synthesis of nanoparticles for biomedical applications. Annual Reports Section “A” (Inorganic Chemistry). 2010;106:553–568. Naik RR, Stringer SJ, Agarwal G, Jones SE, Stone MO. Biomimetic synthesis and patterning of silver nanoparticles. Nat Mater. 2002;1(3):169–172. Nam KT, Lee YJ, Krauland EM, Kottmann ST, Belcher AM. Peptide-mediated reduction of silver ions on engineered biological scaffolds. ACS Nano. 2008;2(7):1480–1486. Anisha BS, Biswas R, Chennazhi KP, Jayakumar R. Chitosan-hyaluronic acid/nano silver composite sponges for drug resistant bacteria infected diabetic wounds. Int J Biol Macromol. 2013;62:310–320. Balaji DS, Basavaraja S, Deshpande R, Mahesh DB, Prabhakar BK, Venkataraman A. Extracellular biosynthesis of functionalized silver nanoparticles by strains of Cladosporium cladosporioides fungus. Colloids Surf B Biointerfaces. 2009;68(1):88–92. Sintubin L, Verstraete W, Boon N. Biologically produced nanosilver: current state and future perspectives. Biotechnol Bioeng. 2012;109(10):2422–2436. Shankar SS, Ahmad A, Sastry M. Geranium leaf assisted biosynthesis of silver nanoparticles. Biotechnol Prog. 2003;19(6):1627–1631. Thomas V, Yallapu MM, Sreedhar B, Bajpai SK. Fabrication, characterization of chitosan/nanosilver film and its potential antibacterial application. J Biomater Sci Polym Ed. 2009;20(14):2129–2144. Anil Kumar S, Abyaneh MK, Gosavi SW, et al. Nitrate reductase-mediated synthesis of silver nanoparticles from AgNO3. Biotechnol Lett. 2007;29(3):439–445. Saifuddin N, Wong CW, Yasumira AAN. Rapid biosynthesis of silver nanoparticles using culture supernatant of bacteria with microwave irradiation. E-Journal of Chemistry. 2009;6(1):61–70. Mukherjee P, Ahmad A, Mandal D, et al. Fungus-mediated synthesis of silver nanoparticles and their immobilization in the mycelial matrix: a novel biological approach to nanoparticle synthesis. Nano Lett. 2001;1(10):515–519. Sadeghi B, Garmaroudi FS, Hashemi M, et al. Comparison of the anti-bacterial activity on the nanosilver shapes: nanoparticles, nanorods and nanoplates. Adv Powder Technol. 2012;23(1):22–26. Li P, Li J, Wu C, Wu Q, Li J. Synergistic antibacterial effects of β-lactam antibiotic combined with silver nanoparticles. Nanotechnology. 2005;16(9):1912–1917. Sondi I, Salopek-Sondi B. 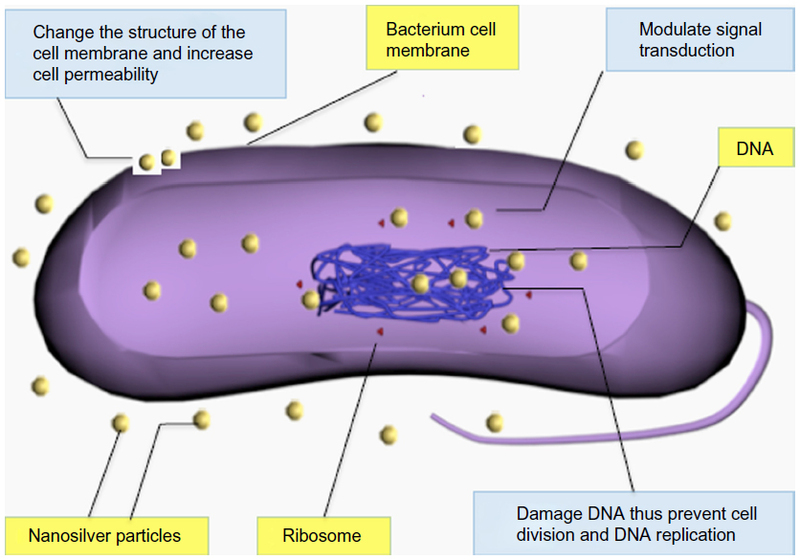 Silver nanoparticles as antimicrobial agent: a case study on E. coli as a model for Gram-negative bacteria. J Colloid Interface Sci. 2004;275(1):177–182. Matsumura Y, Yoshikata K, Kunisaki S, Tsuchido T. Mode of bactericidal action of silver zeolite and its comparison with that of silver nitrate. Appl Environ Microbiol. 2003;69(7):4278–4281. Kim KJ, Sung WS, Moon SK, Choi JS, Kim JG, Lee DG. Antifungal effect of silver nanoparticles on dermatophytes. J Microbiol Biotechnol. 2008;18(8):1482–1484. Nasrollahi A, Pourshamsian Kh, Mansourkiaee P. Antifungal activity of silver nanoparticles on some of fungi. International Journal of Nano Dimension. 2011;1(3):233–239. Kim KJ, Sung WS, Suh BK, et al. Antifungal activity and mode of action of silver nano-particles on Candida albicans. Biometals. 2009;22(2):235–242. Sun RW, Chen R, Chung NP, Ho CM, Lin CL, Che CM. Silver nanoparticles fabricated in Hepes buffer exhibit cytoprotective activities toward HIV-1 infected cells. Chem Commun (Camb). 2005;(40):5059–5061. Lu L, Sun RW, Chen R, et al. Silver nanoparticles inhibit hepatitis B virus replication. Antivir Ther. 2008;13(2):253–262. Taylor PL, Omotoso O, Wiskel JB, Mitlin D, Burrell RE. Impact of heat on nanocrystalline silver dressings. Part II: physical properties. Biomaterials. 2005;26(35):7230–7240. Baram-Pinto D, Shukla S, Perkas N, Gedanken A, Sarid R. Inhibition of herpes simplex virus type 1 infection by silver nanoparticles capped with mercaptoethane sulfonate. Bioconjug Chem. 2009;20(8):1497–1502. Rogers JV, Parkinson CV, Choi YW, Speshock JL, Hussain SM. A preliminary assessment of silver nanoparticle inhibition of monkeypox virus plaque formation. Nanoscale Res Lett. 2008;3(4):129–133. Taylor PL, Ussher AL, Burrell RE. Impact of heat on nanocrystalline silver dressings. Part I: chemical and biological properties. Biomaterials. 2005;26(35):7221–7229. Lara HH, Ayala -Nuñez NV, Ixtepan-Turrent L, Rodriguez-Padilla C. Mode of antiviral action of silver nanoparticles against HIV-1. J Nanobiotechnology. 2010;8:1. Nadworny PL, Wang J, Tredget EE, Burrell RE. Anti-inflammatory activity of nanocrystalline silver in a porcine contact dermatitis model. Nanomedicine. 2008;4(3):241–251. Shin SH, Ye MK. The effect of nano-silver on allergic rhinitis model in mice. Clin Exp Otorhinolaryngol. 2012;5(4):222–227. Castillo PM, Herrera JL, Fernandez-Montesinos R, et al. Tiopronin monolayer-protected silver nanoparticles modulate IL-6 secretion mediated by Toll-like receptor ligands. Nanomedicine (Lond). 2008;3(5):627–635. Chaloupka K, Malam Y, Seifalian AM. Nanosilver as a new generation of nanoproduct in biomedical applications. Trends Biotechnol. 2010;28(11):580–588. Huang Y, Li X, Liao Z, et al. A randomized comparative trial between Acticoat and SD-Ag in the treatment of residual burn wounds, including safety analysis. Burns. 2007;33(2):161–166. Chen J, Han CM, Lin XW, Tang ZJ, Su SJ. [Effect of silver nanoparticle dressing on second degree burn wound]. Zhonghua Wai Ke Za Zhi. 2006;44(1):50–52. Chinese. Lu S, Gao W, Gu HY. Construction, application and biosafety of silver nanocrystalline chitosan wound dressing. Burns. 2008;34(5):623–628. Grunkemeier GL, Jin RY, Starr A. Prosthetic heart valves: Objective Performance Criteria versus randomized clinical trial. Ann Thorac Surg. 2006;82(3):776–780. Jamieson WR, Fradet GJ, Abel JG, et al. Seven-year results with the St Jude Medical Silzone mechanical prosthesis. J Thorac Cardiovasc Surg. 2009;137(5):1109–1115. e2. Andara M, Agarwal A, Scholvin D, et al. Hemocompatibility of diamondlike carbon–metal composite thin films. Diam Relat Mater. 2006;15(11–12):1941–1948. Ghanbari H, Viatge H, Kidane AG, Burriesci G, Tavakoli M, Seifalian AM. Polymeric heart valves: new materials, emerging hopes. Trends Biotechnol. 2009;27(6):359–367. Fu J, Ji J, Fan D, Shen J. Construction of antibacterial multilayer films containing nanosilver via layer-by-layer assembly of heparin and chitosan-silver ions complex. J Biomed Mater Res A. 2006;79(3):665–674. Lackner P, Beer R, Broessner G, et al. Efficacy of silver nanoparticles-impregnated external ventricular drain catheters in patients with acute occlusive hydrocephalus. Neurocrit Care. 2008;8(3):360–365. Alt V, Bechert T, Steinrücke P, et al. An in vitro assessment of the antibacterial properties and cytotoxicity of nanoparticulate silver bone cement. Biomaterials. 2004;25(18):4383–4391. Morley KS, Webb PB, Tokareva NV, et al. Synthesis and characterisation of advanced UHMWPE/silver nanocomposites for biomedical applications. Eur Polym J. 2007;43(2):307–314. Yoshida K, Tanagawa M, Matsumoto S, Yamada T, Atsuta M. Antibacterial activity of resin composites with silver-containing materials. Eur J Oral Sci. 1999;107(4):290–296. Yamamoto K, Ohashi S, Aono M, Kokubo T, Yamada I, Yamauchi J. Antibacterial activity of silver ions implanted in SiO2 filler on oral streptococci. Dent Mater. 1996;12(4):227–229. Magalhães APR, Santos LB, Lopes LG, et al. Nanosilver application in dental cements. ISRN Nanotechnology. 2012;2012:1–6. Ahn SJ, Lee SJ, Kook JK, Lim BS. Experimental antimicrobial orthodontic adhesives using nanofillers and silver nanoparticles. Dent Mater. 2009;25(2):206–213. Haes AJ, Van Duyne RP. A nanoscale optical blosensor: sensitivity and selectivity of an approach based on the localized surface plasmon resonance spectroscopy of triangular silver nanoparticles. J Am Chem Soc. 2002;124(35):10596–10604. Zhou W, Ma Y, Yang H, Ding Y, Luo X. A label-free biosensor based on silver nanoparticles array for clinical detection of serum p53 in head and neck squamous cell carcinoma. Int J Nanomedicine. 2011;6:381–386. Loo C, Lowery A, Halas N, West J, Drezek R. Immunotargeted nanoshells for integrated cancer imaging and therapy. Nano Lett. 2005;5(4):709–711. Haes AJ, Hall WP, Chang L, Klein WL, Van Duyne RP. A localized surface plasmon resonance biosensor: first steps toward an assay for Alzheimer’s disease. Nano Lett. 2004;4(6):1029–1034. Liu J, Zhao Y, Guo Q, et al. TAT-modified nanosilver for combating multidrug-resistant cancer. Biomaterials. 2012;33(26):6155–6161. Skirtach AG, Antipov AA, Shchukin DG, Sukhorukov GB. Remote activation of capsules containing Ag nanoparticles and IR dye by laser light. Langmuir. 2004;20(17):6988–6992. Etheridge ML, Campbell SA, Erdman AG, Haynes CL, Wolf SM, McCullough J. The big picture on nanomedicine: the state of investigational and approved nanomedicine products. Nanomedicine. 2013;9(1):1–14. Shin SH, Ye MK, Kim HS, Kang HS. The effects of nano-silver on the proliferation and cytokine expression by peripheral blood mononuclear cells. Int Immunopharmacol. 2007;7(13):1813–1818. Park S, Lee YK, Jung M, et al. Cellular toxicity of various inhalable metal nanoparticles on human alveolar epithelial cells. Inhal Toxicol. 2007;19 Suppl 1:59–65. Soto K, Garza KM, Murr LE. Cytotoxic effects of aggregated nanomaterials. Acta Biomater. 2007;3(3):351–358. Hussain SM, Javorina AK, Schrand AM, Duhart HM, Ali SF, Schlager JJ. The interaction of manganese nanoparticles with PC-12 cells induces dopamine depletion. Toxicol Sci. 2006;92(2):456–463. Hussain SM, Hess KL, Gearhart JM, Geiss KT, Schlager JJ. In vitro toxicity of nanoparticles in BRL 3A rat liver cells. Toxicol In Vitro. 2005;19(7):975–983. McAuliffe ME, Perry MJ. Are nanoparticles potential male reproductive toxicants? A literature review. Nanotoxicology. 2007;1(3):204–210. Kone BC, Kaleta M, Gullans SR. Silver ion (Ag+)-induced increases in cell membrane K+ and Na+ permeability in the renal proximal tubule: reversal by thiol reagents. J Membr Biol. 1988;102(1):11–19. Carlson C, Hussain SM, Schrand AM, et al. Unique cellular interaction of silver nanoparticles: size-dependent generation of reactive oxygen species. J Phys Chem B. 2008;112(43):13608–13619. Hsin YH, Chen CF, Huang S, Shih TS, Lai PS, Chueh PJ. The apoptotic effect of nanosilver is mediated by a ROS- and JNK-dependent mechanism involving the mitochondrial pathway in NIH3T3 cells. Toxicol Lett. 2008;179(3):130–139. Takenaka S, Karg E, Roth C, et al. Pulmonary and systemic distribution of inhaled ultrafine silver particles in rats. Environ Health Perspect. 2001;109 Suppl 4:547–551. Kim YS, Kim JS, Cho HS, et al. Twenty-eight-day oral toxicity, genotoxicity, and gender-related tissue distribution of silver nanoparticles in Sprague-Dawley rats. Inhal Toxicol. 2008;20(6):575–583. Lee KJ, Nallathamby PD, Browning LM, Osgood CJ, Xu XH. In vivo imaging of transport and biocompatibility of single silver nanoparticles in early development of zebrafish embryos. ACS Nano. 2007;1(2):133–143. Lansdown AB. Critical observations on the neurotoxicity of silver. Crit Rev Toxicol. 2007;37(3):237–250. Ji JH, Jung JH, Kim SS, et al. Twenty-eight-day inhalation toxicity study of silver nanoparticles in Sprague-Dawley rats. Inhal Toxicol. 2007;19(10):857–871. DiVincenzo GD, Giordano CJ, Schriever LS. Biologic monitoring of workers exposed to silver. Int Arch Occup Environ Health. 1985;56(3):207–215.